Book publishing, as an industry, is not unlike a Jenga tower held together by sheer force of will. If the industry works at all, it's only because many dedicated and diligent people work or little reward like that horse, Boxer, from Animal Farm. (Though it's not all gloom-and-doom; it can certainly have its moments.) Many publishing workers remain invisible to readers and even authors, toiling away on initiatives and tasks unfamiliar to all but those already deeply enmeshed in the publishing world. 'Acknowledgements' is an interview series that aims to change that in some small way. If you've ever visited Toronto's Coach House, home of both Coach House Books and Coach House Printing, or called the company for a print estimate, you've probably encountered John DeJesus. A few months ago, publishers Wolsak & Wynn posted a photo of DeJesus on their Facebook page with the caption: 'A rare photo of John at Coach House Printing. He's been shepherding our books through their presses as long as I've been publishing and always does the impossible. I can't count the number of times he's pulled books out of nearly thin air for us. And he's saved us from one or two nasty mistakes over the years.' The same statement could be made by a number of Canada's independent presses. Though they tend to shun the limelight, DeJesus and the entire crew at Coach House are responsible for the production of hundreds of Canadian titles of poetry, fiction, drama, and nonfiction every year. And as production manager, DeJesus oversees the entire printing process. In an interview with Open Book, the secret hero of indie presses talks a bit about what the production manager does at Coach House. If you ever need an estimate on a book, he'd be happy to help. Production managers' tasks are legion. and I even help out in the bindery when necessary! As a printer, Coach House works with a lot of different clients. DEJESUS: We print roughly 200 to 250 titles a year for publishers and other clients. That includes Coach House Books, the Fisher Rare Book Library, House of Anansi, ECW, Goose Lane, Insomniac, Palimpsest, Pedlar, TSAR, Tightrope, Wolsak & Wynn. We also print a bunch of the U of T literary college magazines. The production manager is usually the most popular person on the telephone. DEJESUS: I receive a lot of phone calls. It's mostly publishers. They're probably trying to find out the status of their books, or are changing specs or changing shipping. People are also calling because they want to get a quote, and some of them are the ones who say, 'We would like to get two books printed.' And you have to disappoint them. [Laughs.] Or other people calling about whether they can sell us stuff. And all of those calls are sent to me. Craftsmanship is extremely important in the printing game. Especially when working on smaller print runs. DEJESUS: We focus on small print runs because that's the way we've positioned ourselves. We've picked machines that are very quick to setup (which has worked out for us). Publishers are printing fewer books in this market, which is why it's that much more important to create and produce great-looking books. We have a lot of experienced workers here at Coach House. I think my last count was over 200 years among the six full-timers here. We've seen it all and know how to get the best out of our equipment. I think the reason we get chosen is because we care about the way the book looks and feels in one's hands. But he's no slouch in the speed department either. DEJESUS: When everything lines up, I think we've completed an edition in twelve hours. Or one long day. Born with a press sheet in his hands. DEJESUS: I've been here since 1983. I started high school at De la Salle and in grade 10 I transferred to Central Tech. with a friend of mine. We were both at la Salle and said, 'This is enough of this.' Central Tech had courses like automotive, carpentry, electrical, and graphic arts/printing. In grades 11 and 12, I majored in graphic arts/printing. They had actually a KORD at Central Tech. A KORD printing press, which I got to run a couple of times. While in grade 12, Stan [Bevington, founder and owner of Coach House Printing] called one of our teachers and asked for a couple of students to help out in the bindery after school. So a fellow student and I went, but we couldn't find the place. We had to call in for directions ... not a good start! Never underestimate the importance of keeping your workstation clean. DEJESUS: The other student and I helped in the bindery two to three days a week. Stan came into the bindery one evening and said one of us should learn how to print. Neither of us jumped at that idea, so Stan just picked one of us. I'm glad it wasn't me! I remember the next day coming into the pressroom and seeing press sheets all over the floor and one very frustrated kid. When Stan saw this, he walked over to me and said, 'John, you're next!' I wasn't much better, but at least I kept the floor clean, which made it appear like I was getting the hang of it! I stuck it out and became the pressman here through the '80s and early '90s. Then I started to take on more responsibilities such as ordering supplies and scheduling jobs. I was keen on that aspect of the work, so I went to Ryerson and got my Graphic Arts Management Certificate over three years while still working at Coach House. DEJESUS: The presses are forty-five years old. The bindery equipment, between thirty and forty-five years old. The newest piece of equipment we have here might be … let's see … the laminator is about fifteen or twenty years old. No, probably the AGFA SelectSet 7000, which is the machine that images the film. And that's probably fifteen years old or something like that. Because it's old equipment, it's hard finding parts or people who can fix them. But luckily for us our pressman, Tony Glenesk, is also our repair specialist, and maintains not only our presses, but most of our equipment. 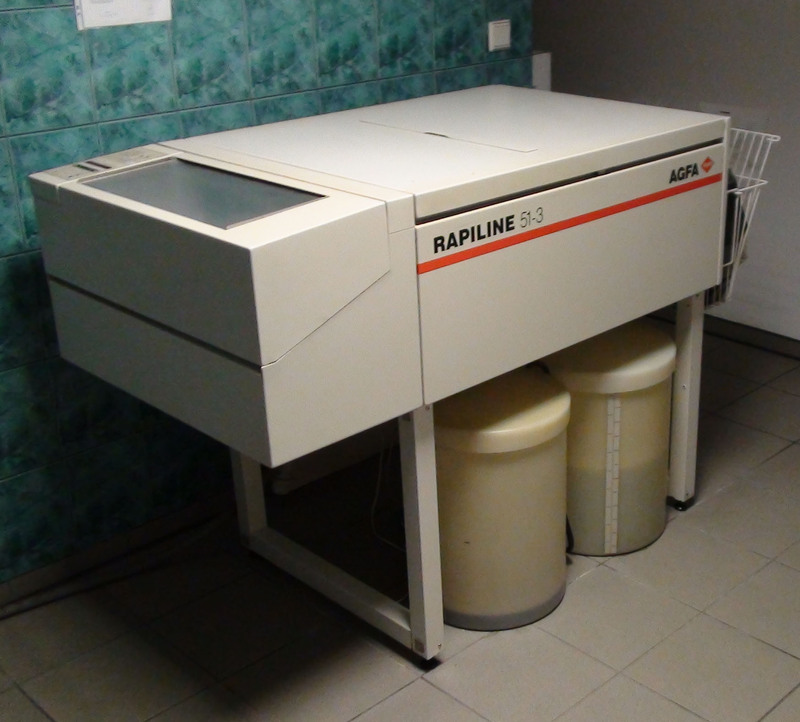 And with some of our other machines we do have companies that service them like our polar cutter and AGFA imagesetter. Not that he's looking for new printing technology. DEJESUS: Technology just means you avoid getting your hands dirty. We like to get our hands dirty here at Coach House! But he wouldn't say 'no' to more square footage. DEJESUS: Here at Coach House we work very close with each other. Literally. I'd love to have more space! HIs workplace could double as a safe house. It's a bit hidden. DEJESUS: I found that! No, we don't like to keep it that way, but we are in a coach house, and when they founded it and moved into the building, I don't think they were looking for Bloor and Avenue Road. Once you've been here, you know how to find it. The only problem we have is when new couriers try to find us. How do people find us? I think that's what it is, word of mouth. A publisher will pick up a book from another publisher and flip through it, and say, 'This is a really nice book, where did you get it printed?' And that's where we get the call. Anansi was sort of that way, and a couple others that just recently started getting their books done here. Working in production for a few decades can make anyone a bit of a print snob. DEJESUS: I think about the binding ... how well it's bound ... is the trimming perfect? I'll then flip the pages and test the grain of the paper on the cover and text. My pet peeve is books printed and bound with the grain wrong. I then feel the paper, check out the design, the printing, the margins or lack of them. Some of the print jobs Coach House has done have been … different. DEJESUS: All I'll say about in regards to the strangest book is that we told Tony [Glenesk, Coach House pressman] to come in on the weekend, pull down the shades, and print it quickly! If you're ever in the market for a small print run, contact Coach House Printing and ask to speak to John. Stay tuned for more 'Acknowledgements' throughout May.